When trying to find or researching gun holsters, it's very important to have a basic understanding of terms that are are common in the holster and shooting industry. Not understanding basic holster terminology, can lead to confusion and some potential problems as you may not be buying or receiving the style, type, or holster model that you think you are. Having owned a gun store for 15 plus years, I can tell you firsthand that not understanding the holster lingo is a recipe for disaster. For example, I can't tell you the number of times a customer has ordered an IWB holster, not fully understanding what IWB (inside the waistband) means. As soon as the holster arrives to the customer, they call back claiming that they have received the wrong or incorrect item. In actuality, they received exactly what they ordered; they just didn't take the time to learn the lingo. Shooting Hand - Refers to the hand that you actually shoot with. Outside the Waistband or OWB - Means that the holster is worn on the outside of the waistband in some fashion versus inside the waistband. Inside the Waistband or IWB - Means that the holster is worn inside the waistband in some fashion. 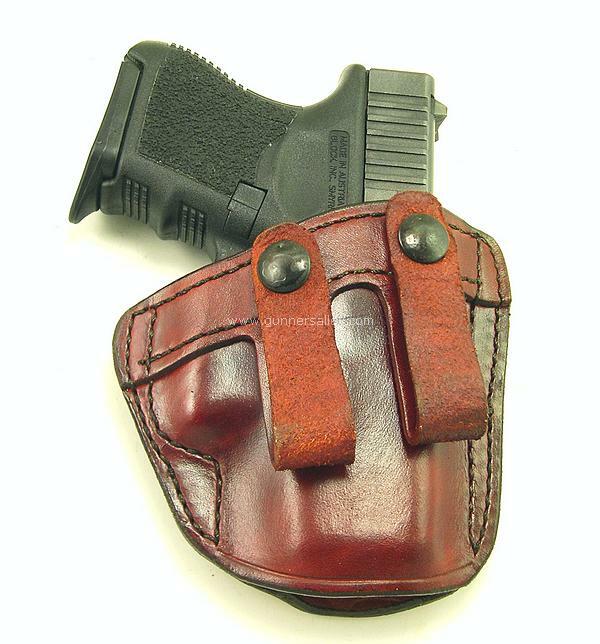 Tactical Holster - Refers to a holster that worn on the thigh of the shooting hand side. Ankle Holster - A holster specifically designed to worn on the ankle. Shoulder holster - A holster that incorporates a harness worn over the shoulder or shoulders. The holster portion of this rig usually rides under the armpit of the wearer's weak side. Crossdraw - A term used to describe a holster that rides on your weak side, but the drawing motion is performed across the body with the shooting hand. These holsters can be either OWB or IWB. Small of the Back or SOB - Refers to a holster that carried in the small of the back near your spine. These holsters can be either OWB or IWB. Strongside - A term used to describe the shooting hand side of the body. For example, if you shoot with your right hand, then the right side of your body (in particular your right side waist) would be considered your strongside. Weakside - A term used to describe the non-shooting hand side of your body. For example, if you shoot with your right hand, then the left side of your body would be considered your weakside. Offside - Another term used to describe your weakside hand (see Weakside above). Cant - Refers to the angle that the holster rides. A straight up (also called a 0 cant) and a forward cant are typical in the shooting industry. Bodyshield - A term used to describe a shield that serves as a protective barrier between the weapon and shooter's body. Tension Screw - Refers to a screw based device mounted within the holster itself that allows the shooter to adjust the draw tension to his/her specifications. There are other terms that can be used, but the ones listed above will cover most situations. If you are shopping for a handgun holster, take a few moments to get familiar with these terms.